12/365(+1), a photo by Luca Rossini on Flickr. Regardless being an antifascist country by constitution, Italy still hosts many glorious referrals to Benito Mussolini, the Duce. This place in particular is an old school triumph of hymns to fascism and praises of Mussolini. 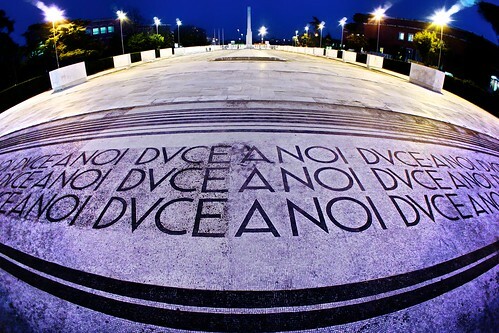 It is just in front of the Stadio Olimpico (literally “Olympic Stadium”), Rome’s football stadium. Aesthetically speaking, the place is quite enjoyable, with its pure futuristic style. Morally speaking? Well, it has been well proved in the last years that what to most foreigners could seem absurd, when not revolting, happens to leave us Italians quite indifferent. May be we are well worth tyrants or debatable prime ministers, since we seem to actively ask for them, as with the freakingly idiotic sentence in the photograph: “DUCE A NOI” – Duce to us!